The Contax II, introduced in 1936 by Zeiss Ikon in Dresden, was the first camera with a combined range/viewfinder; but its virtues went much farther than that. This particular example is shown with a Contameter parallax compensating rangefinder and matching 20cm closeup lens. Introduced in 1936, the Zeiss Contax II was a completely different camera from the series of Contax cameras (now collectively referred to as "Contax I") that had preceded it. It was only four years since the original Contax's introduction, and only 10 since the formation of Zeiss Ikon itself. The Contax II was the company's tour de force, offering features that would not appear elsewhere for decades. Zeiss had been involved in a game of one-upsmanship with Leitz since 1932: The Contax I offered a coupled rangefinder at about the same time as the Leica II; both then upgraded to extend the range of shutter speeds in subsequent models. With the Contax II, however, Zeiss pulled clearly ahead by adding features that could not easily be incorporated into the Leitz design. The most visible of these was the huge, combined view/rangefinder system that occupied the entire top of the camera. It was not only the size of this system and its single eyepiece, however, that made it unique: the entire optical system was composed of a single prism, covering both of the front windows and all of the space in between. At the right hand end, the front of the prism was ground in the shape of a cylinder, and in front of it a plano-cylindrical lens swung back and forth as the lens focused. With such a design, there were no mirrors to come loose, no small pivoting prisms to be knocked out of alignment... vertical misalignment of the image became nearly impossible, and the entire system was not only the most accurate and the most convenient to use of any in the world: it was also the most rugged. 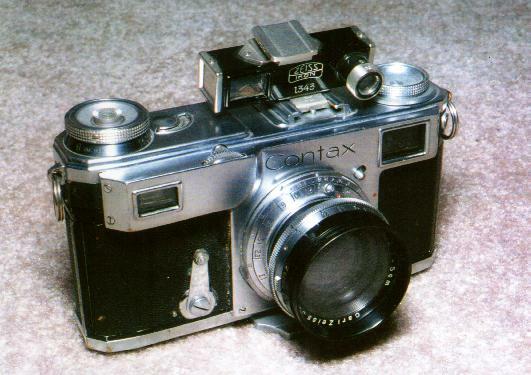 The Contax's shutter also offered unique advantages. Based on the Contax I design, the vertical shutter used only a single pair of ribbons to carry both the opening and the closing curtain, relying on the friction of the ribbons to hold the closing curtain in its proper place during travel. While this seems odd at first, the advantages far outweigh the drawbacks. The primary problem with a typical focal plane shutter is the difficulty of making both curtains travel at exactly the same speed, as even a small difference can cause fading at high shutter speeds. With the Contax system, fading is impossible as there is only a single transport mechanism carrying both curtains. This unique advantage allowed the Contax shutter to operate at the unheard-of top speed of 1/1250 second with perfect reliability. The shutter design also allowed all speeds to be set on a single dial, this being combined with the film winding knob to create a very streamlined package. And, unlike the Leica, the shutter dial did not rotate during exposure, eliminating the risk of a shot being ruined by a misplaced fingertip. The slow speed limit of the Contax shutter was 1/2 second, as opposed to the 1 second of the Leica IIIa. But Zeiss had another feature to offer: a mechanical self-timer, whose design set the pattern for all to follow for the next 50 years, came as standard equipment on the Contax II, and it had a special trick. With the shutter speed set to 'B', the self timer was designed to provide the missing 1 second shutter speed. The lenses offered for the Contax II, like those for the original Contax, were superior to their Leitz competitors in nearly every respect. The main reason for this was Carl Zeiss' philosophy of designing complex lenses with large cemented groups, leaving as few glass/air surfaces as possible to produce flare-inducing reflections. Thus, all Sonnar lenses from 50 to 180mm, some having as many as seven elements and speeds as high as f/1.5, are composed of only three cemented groups, presenting six glass/air surfaces. In the prewar days before antireflection coatings, this difference was crucial. After the war, when coatings reduced the effects of lens surface reflections, this Zeiss feature lost much of its relative value. Other features that the Contax offered over its main rival included easier loading, cartridge-to-cartridge transport, groundglass accessory backs and, of course, with the Model III, a built-in light meter. After the War, with the Contax facility lost in any case, Zeiss set out to address the perceived shortcomings of the Contax in designing the new Model IIa and IIIa. These were smaller, lighter and quieter, their shutters went to 1 full second, and they no longer required periodic replacement of the shutter ribbons. But in the exchange, their rangefinders were no longer immune to misalignment, nor were their shutters immune to fading or to hanging up at slow speeds. Overall, a prewar Contax is likely to give better service today than a postwar one, once its ribbons are in good shape. The postwar lenses were improved, but the rate of improvement was faster at Leitz, where antireflection coatings had suddenly lifted their most serious handicap. It is somewhat ironic that, having insisted before the war on the value of small size, simplicity and light weight, Leitz finally drove the nails into the coffin of a small, light Contax by introducing a larger and heavier Leica to incorporate the Contax II's features. It may be even more ironic that Nikon established its reputation with a virtual Contax copy, before finally rendering the entire 35mm rangefinder category obsolete with the introduction of the Nikon F SLR. The Contax II remains greatly underappreciated today, and a good one can be obtained for less money than any number of much lesser machines.